Surveys program were initiated in August 2017 with the session on “Sexual Harassment at Workplace” and this practice is continuously followed in other sessions (Quality Journey, Eye Donation Awareness) since August 2017. Online surveys are conducted among the members before the program and the results thereof are analyzed in real time and shared with the audience. The increasing number of survey responses exponentially, with every passing program is serving the purpose of connecting the audience with the speaker and the subject of the session, thus making the session more interactive and interesting. 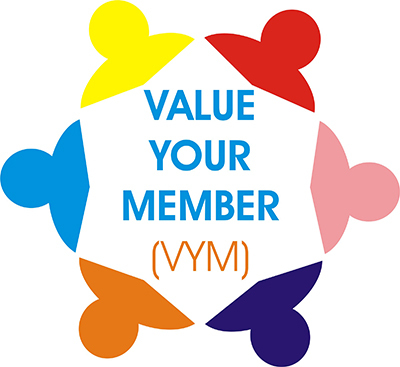 Value Your Member (VYM) Initiative is an endeavor by CMA to know more about its members as an individual and professional. It is also an effort to know about their area of expertise and the way a member can contribute to support the objective of CMA “promote the management profession” in Chandigarh and around, through the sessions/ talks they can deliver to CMA fraternity. 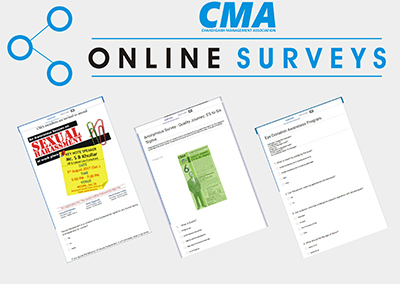 In pursuance of the VYM initiative, CMA designed an online form for gathering the personal/ professional information of the member and moved a step ahead by adding the new members in CMA Whatsapp group within one week of their filling up the membership form and credit of their membership fee in CMA’s bank account. This requires an approval from EC members in “CMA EC 2017-18” WhatsApp group, however, the membership number and the certificate are generated only after formal approval by the EC members in EC meetings. The objective of this initiative is to minimize the time gap and make them feel valued by addition of their names eventually. Synergize is the habit of creative cooperation. It is the interaction/ cooperation of two or more organizations/ members/ substances to produce a combined effect, which is greater than the sum of their separate effects. With a thought process of TEAM – Together Each Achieves More, we all will create a Synergy to further the cause of promoting Management profession in India. We support this initiative by sharing our monthly eNewsletter (July 2017 onwards) with other LMAs, mutual participation in events organized by other LMA’s of AIMA/ Management Associations/ Industry Associations as a part of sharing/ gaining more knowledge and thus energizing our awareness about different management subjects. 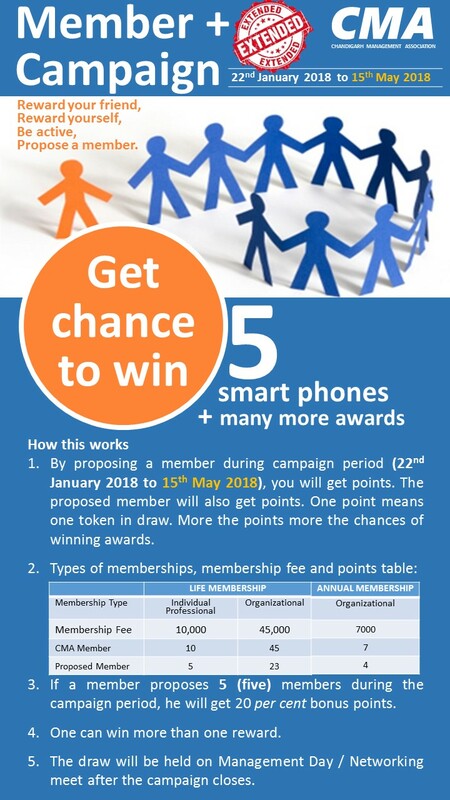 CMA has come up with MEMBER PLUS CAMPAIGN to further expand its membership base with quality members. Reward your friend, Reward yourself, Be active, Propose a member and get chance to win awards.